1. Log into your personal Bank of America bank app on your mobile phone and click on the bottom menu for Transfer/Send and click Send. 2. Enter contact@christusministries.org as the email address to add Christus Ministries as a recipient. 3. 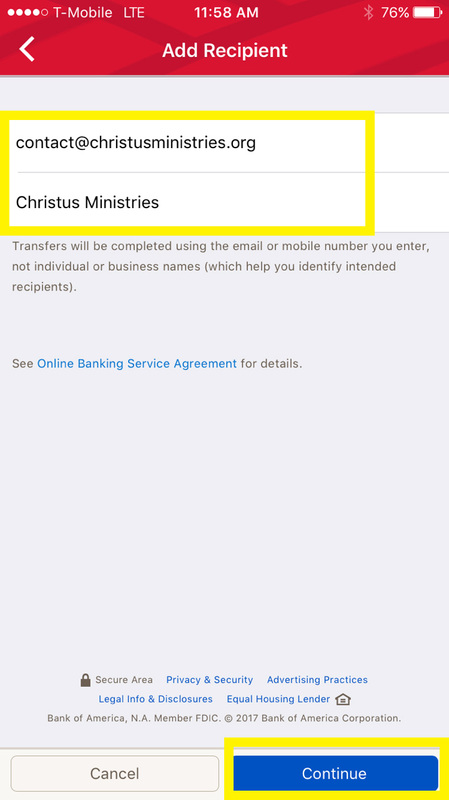 Add Christus Ministries as the recipient name and click Continue. 4. Enter the amount you wish to donate/pay. Click Continue. 5. Click on "What's it for?" and type your name and event OR email address if it's a donation. Click Send Money.